Today is all about catching up with housework and relaxing before a busy week. As part of that, I decided our main altars were in some serious need of cleaning. It’s the less glamorous side of my Druid practice, but a necessary chore. The altar gets very dirty from burning incense. The cats sometimes go up there to say hello and have a sip of holy water (sigh). And of course, the usual dust accumulates over time. 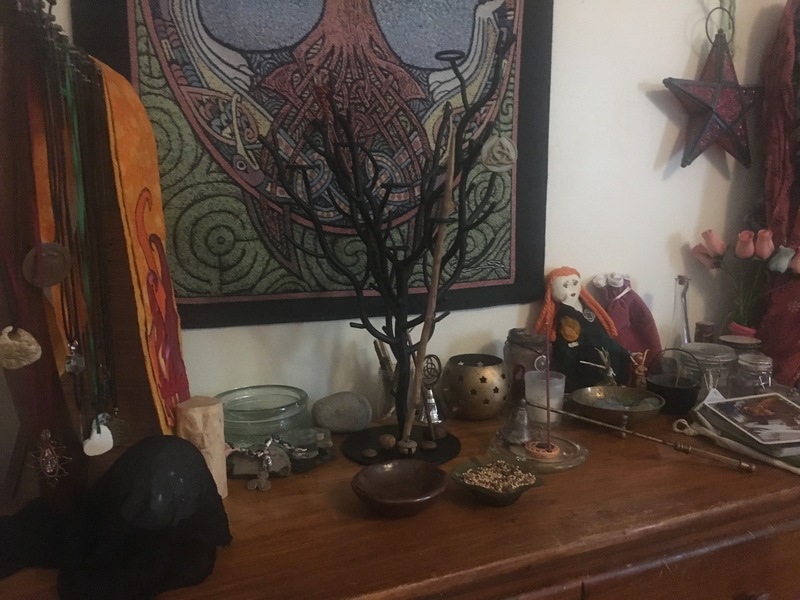 My daughter was curious about my activity, so I took the opportunity to explain that our altars are like special chairs and tables for our spirit friends. It’s a place where we can get together and talk easily. It’s where we put their food, drink, and other gifts. Just like we have to clean up after our own meals, we need to clean up the altar so the spirits have a nice space to visit. Even if such earthly concerns are ultimately of little consequence to them, cleaning shows respect and is part of our reciprocity. It helps us maintain our relationships and our discipline.